Haven't heard of Prism yet? Alright, so I have my first render for Prism. It's not much, but it looks pretty good if you ask me. It's an eye! This time this blog is a few hours behind newgrounds and deviantArt, where I also publish stuff related to Prism, but I promise that won't always be the case. As for that, I am not even promising that everything will always be published on all three of the media - though when it comes to renders they probably will (for now at least...). 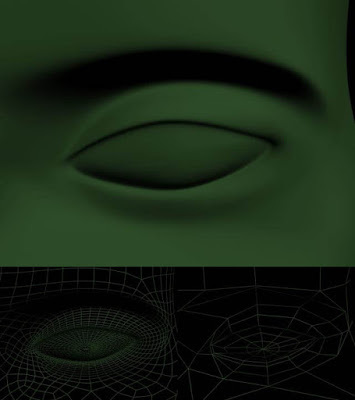 The upper image is the final render of the eye (at 4 NURMS iteration for those who want to know), the lower-left image is a wireframe of the same setup (alright, alright, only 2 NURMS iterations, but that's because it would get too cluttered otherwise) and the lower-right image is the wireframe of the model as I modeled it (without NURMS, that is). I hope you liked the brief preview! Man, I really thought I had the answer - what I am talking about in the last post, that is (The Land of Manuals). But just see how much time has past between this post and that one - and it appears it was a failed attempt. Well, maybe it was. But that does not mean I am going to stop using this blog, nor that I will discontinue the "Land of Manuals." I'll see if I can find some time today or tomorrow in order to write the first installment of the series (episode isn't quite the word, installment is a natural fit though ;). However, currently I am busy working on a new project: Prism. I am not quite telling you much about it just yet - but I can tell you it will supposedly become a flash movie series. Those who know me in real life might know, I cannot draw. If I have a ruler and can look at what I am drawing every two seconds AND the shapes are easy, I might produce something that is recognizable (NB: that is, I have (and take) a lot of time to work on it as well). That means I won't be able to produce a nice flash movie (let alone a series), right? Wrong. I can't draw, but I am not going to draw. I am going to model it in 3D. I am going to make models of everything I want in the movies and animate it with the models - and when I rendered a movie out of that I will convert it to flash. It does take forever, though (I have spent a great number of hours on a single eye socket now...).